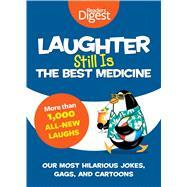 More than 1,000 jokes, quotes, anecdotes, and cartoons from Reader’s digest magazine—guaranteed to put laughter in your day. This hilarious collection offers up some of the funniest moments that get us through our day, in the form of jokes, gags and cartoons that will have readers laughing out loud. Editors have mined the Reader’s Digest archives to bring readers Laughter the Best Medicine, All-Time Faves, a collection of the most hilarious jokes and anecdotes we’ve come across over the years. As you turn the pages of our newest collection, you’ll realize once again that laughter is always the best medicine. Reader’s Digest is a global media and direct-marketing company that educates, entertains, and connects more than 130 million consumers around the world with products and services from trusted brands. With offices in 43 countries, the company reaches customers in 78 countries, publishes 91 magazines, including 50 editions of Reader’s Digest, the world’s largest-circulation magazine, operates 78 branded websites and sells 40 million books, music and video products across the world each year. Further information about the company can be found at www.rda.com.